I've got a fever... and the only cure may be Deadlands. Here's the issue. I've been geeking out somethin' fierce with the new Savage Worlds Adventure Edition Kickstarter going on right now. I spent the entire weekend flipping through some of my old Savage Worlds books, reminiscing on previous games and campaigns, and cooking up some thoughts for new sessions. 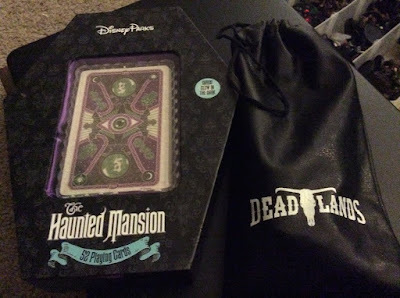 But then I came across my Deadlands stuff, and my future goals all became a lot more immediate. See, I can't ever seem to open a Deadlands book without doing a complete gaming U-turn, and taking the first locomotive back to the Weird West. One quick read of Bruce Campbell's forward in the the original Deadlands Weird West Player's Guide, and I'm in a full western tailspin. I'm back to reading The Sixth Gun, watching Westworld, and booting up Red Dead Redemption. But it's been years since I've had a long term Deadlands game cookin'. I had a couple Deadlands Classic campaigns back in the mid-2000's, and was a player in a long running Deadlands Hell on Earth campaign (RIP Joaquin Vega.) 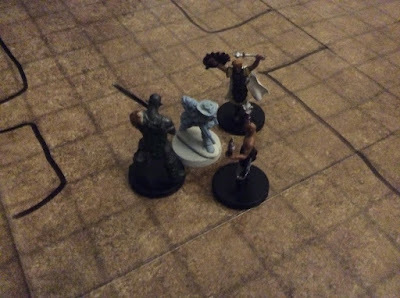 Other than that, all my Deadlands action has been one-shots, many with the Norwin Game Knights. Flipping through just one of those books reignites the urge. I should note that it's really, REALLY hard not to come across a Deadlands book whenever digging through my pile of gaming materials. What I really want to do with Deadlands Reloaded, and what I've always wanted, is to do a live, in-person campaign. Not a one-shot. Not a con game. Not an online campaign. Real people in a real room with real dice, real Fate Chips, and real playing cards. Playing once a week. Hell, maybe we could even get through one of the four incredible plot point campaigns I own. Unfortunately, I don't live close to enough people whom I know who would be able to take part in a regular, weekly game. Even Jen and the girls have such busy schedules now that they just don't have as much time as they used to in order to game with their dad. 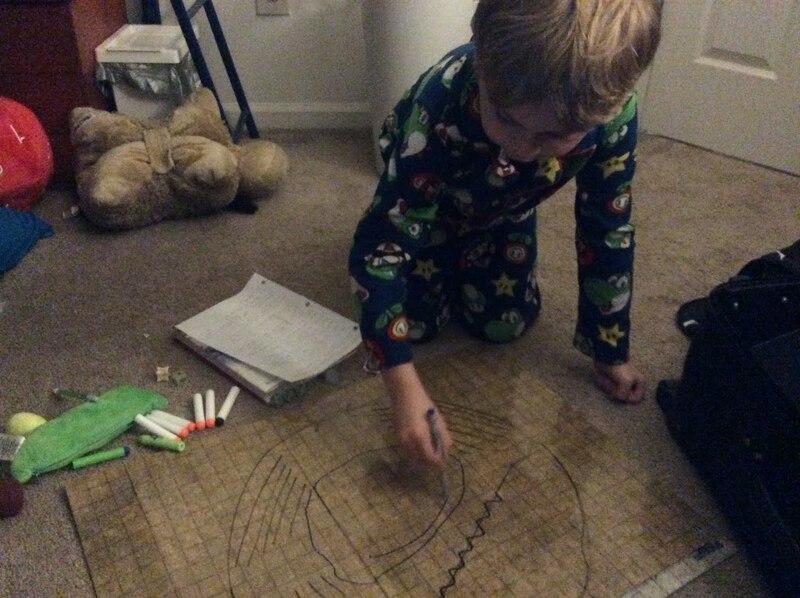 Evie was Cooper's age when we first started Numenera: Disenchanted Tales back in early 2014. 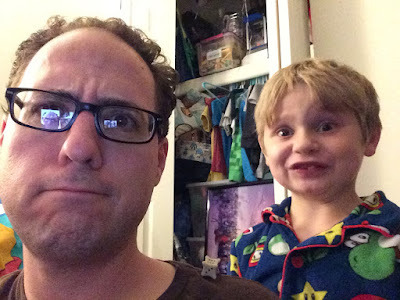 We've been talking about ways to help get Cooper away from his TV and his Nintendo Switch, without having to institute hard limits. 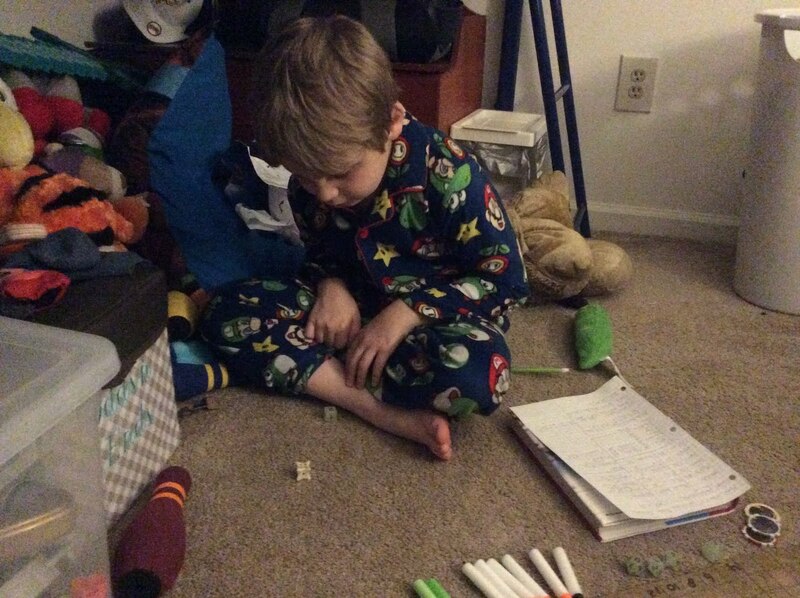 Maybe a bedtime game, styled like what I had run previously for his sisters, would have similar beneficial effects. He took party in our Savage Skylander's Skirmish game. He played WALL-E during a short-lived Last Parsec campaign. He took on the role of Foxy the Clockwork Pirate during a sandy series of 50 Fathoms sessions. 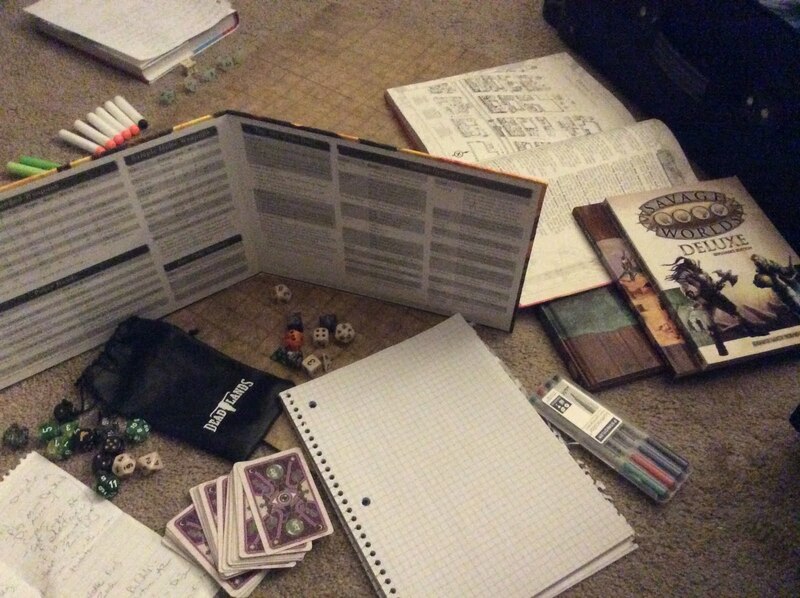 That said, its been a few years since Cooper's played any role-playing game. 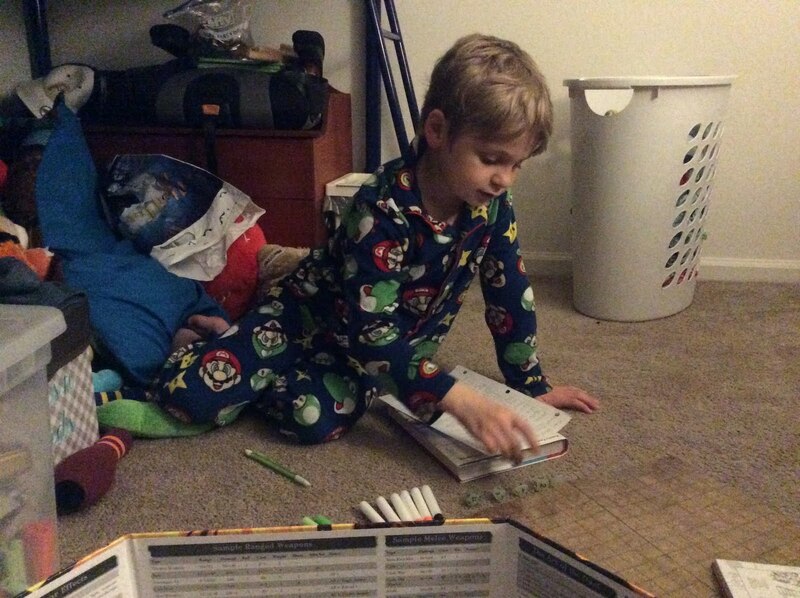 He's dedicated his time to electronic gaming, and does a fair bit of board gaming as well. But with his sister' graduating to the grown up table, I think Cooper's been feeling left behind. 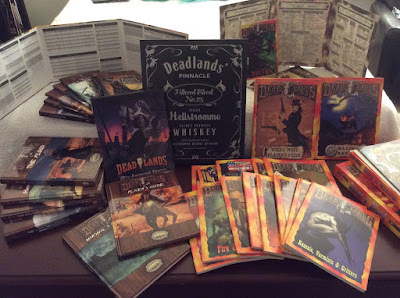 In addition to Savage Worlds being a game Cooper was somewhat familiar with, Deadlands Reloaded has a lot of features and themes that would excite my eight-year old son. 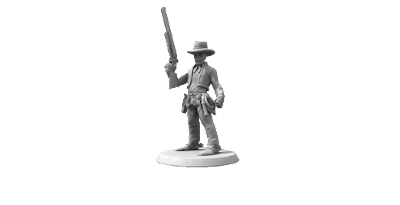 So much of the Weird Western style, coupled with the "Fast, Furious, Fun" of Savage Worlds appeals to younger players. Back when we ran the Norwin Game Knights, it was never hard to pick up a whole table of young players willing to take to the dusty trails. Also, there are the Harrowed, and Cooper really has a thing for the undead. I think it started with Plants vs. Zombies and just progressed from there. Maybe if I let Cooper play a harrowed from the get go I'd be able to pique his interest right off the bat? So we planned a bedtime one shot for last night, with a subsequent session planned for tonight. If both go well, we'll set up regular games at home, perhaps with some guest stars from our friends and family. 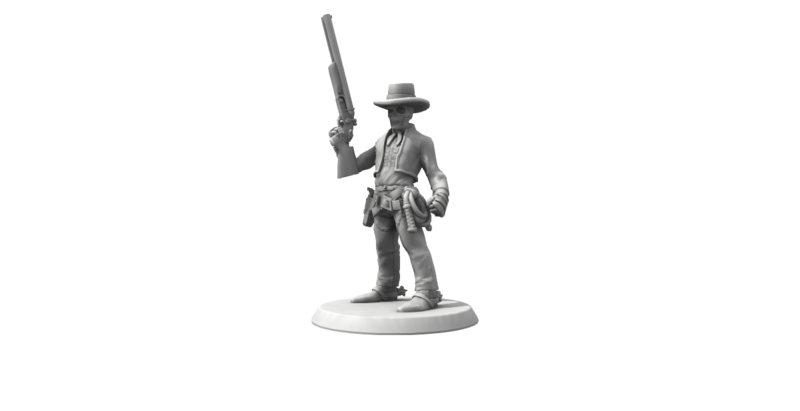 The skeletal outlaw is a harrowed from Tombstone, who had big plans in the CSA a year ago. Sebastian took part in a massive heist to steal the tomb of George Washington. After dismantling the structure, Sebastian and his partner Mr. Zink attempted to make delivery to a gentleman named Billy Bob Jenkins in exchange for one million dollars. But it was a set up! Instead of becoming rich, Sebastian had to flee Virginia and the Texas Rangers. He made his way to Philadelphia. But Sebastian longs to go home. Recently Sebastian got a telegram from his good zombie friend (or "zombro") Mr. Zink. Mr. Zink had found his way to Dodge City, and wanted to link up with Sebastian so that they could travel back to Dodge City together. Image from Hero Forge. 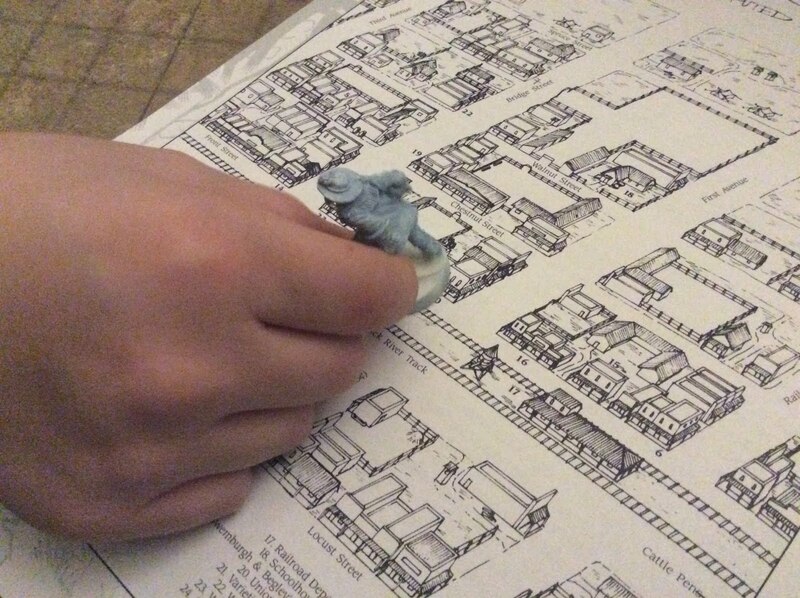 If Cooper successfully completes 10 sessions, I promised him a custom Sebastian Squelette figure that I will paint for him. I made just a couple of adjustments to our game to help Cooper re-learn the system, and not overly complicate our game. Exchanged Fate Chips for the more Savage Worlds standard "Bennies." I figure we'll go back to Fate Chips later, once he mastered the process. I gave Sebastian Hinderances that are more suited for the GM to track. Wanted, Phobia, and Enemy can all reside on my side of the screen, and don't necessitate too much active role-play, at least in the beginning. For tracking ammo, I had Cooper break out six white Nerf bullets (pistol ammo), and two green Nerf bullets (shot gun ammo.) Heck, I think I may use this for my grown-up players at some point! It was early evening when Sebastian's train entered Dodge City. Once he got out of the car, he called out "Mr. Zink! Mr. Zink!" Strangely enough, this method of investigation worked. A passerby, unfazed by Sebastian's skeletal visage, stated that he knew a Mr. Zink, and had seen him earlier having a drink over at the Alhambra Saloon. Sebastian strolled into the Alhambra Saloon, sauntering up to the bar while a musician played a few pleasant tunes on a piano. The skeleton asked the bartender where he could find Mr. Zink. The bartender claimed that the zombie had left a few hours earlier with a traveling salesman. But something wasn't right. Sebastian sensed that the bartender was lying. "Tell me the truth!" Sebastian shouted at the bartender. The bartender cried out that Mr. Zink had been press-ganged by the circus on the north side of town. That was no good. Sebastian walked out into the dark streets of Dodge City, headed north towards the circus. Soon a trio of clowns encircled the skeleton. "Well, well, what have we here? Wanna join the circus, skeleton?" they asked. The clubs they were carrying seemed proof enough that they weren't actually asking. "Okay," Sebastian responded. Outnumbered, he figured that he was headed to the circus anyway, so why not see where his path led. The clowns took his shotgun, but Sebastian was able to hide his Colt Navy Revolver in his pants. Cooper wanted to help draw the map of the circus big top. When Sebastian entered the big top, he gasped. There, in the middle of the giant circus tent, was the Ringmaster Philippe, guiding a tiger around in circles. Sebastian hated tigers! Sebastian choked back his fear, and continued with the clowns towards the backstage area. I gotta say, Cooper impressed me with one of his decisions. When the three clowns appeared, I figured that we were going into combat. I drew the map, placed the miniatures, and broke out the playing cards. But Cooper kept his finger off the trigger, and went along with the clowns. Pretty impressive! As we move along in the campaign, I'll continue to post updates. If you'd like to join us, please be on the lookout for our adventures. And again... if you'd like to join Sebastian Squelette and Mr. Zink on the dark trails of the Weird West, let us know. Maybe there's room in the posse for someone to ride shotgun. Jadwal Cockfight SV388 2 Maret 2019 di Situs Judi Sabung Ayam Online Melalui Agen Resmi Taruhan Sabung Ayam Live Asli Thailand. Judi Sabung Ayam - Sabtu, Aceh 2 Maret 2019 – Kami Selaku Agen Sabung Ayam 2018 Akan Memberikan Informasi Mengenai Jadwal Cockfight SV388 2 Maret 2019. Savage Worlds Adventure Edition Kickstarter!